Tandem switching consists of non-customer-facing switches that are configured to route traffic amongst themselves or to other switches for such purposes as capitalizing on preferential rates, etc. 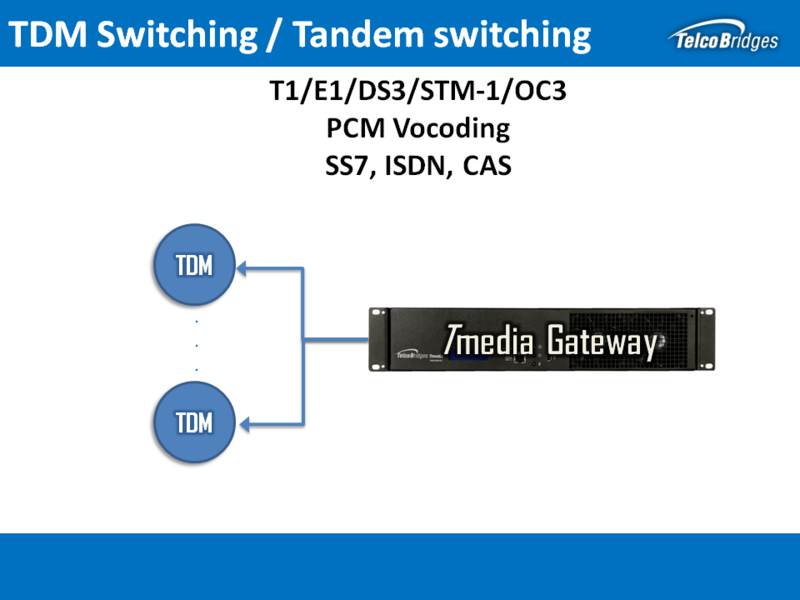 TelcoBridges' Tmedia gateway provide capabilities for tandem / class 4 switching by switching voice traffic between end-office switches and VoIP networks. Our tandem / Class 4 switching solutions use SS7, provide flexible & extensive call routing, as well as providing CDR generation, and a non-blocking switching fabric. Of course, as with all of our products and solutions you can expect top quality and reliability as well as fully redundant solution offering industry leading High Availability. TDM infrastructure, greatly simplifying deployment and maintenance. Our flexible and extensive call routing capabilities allows you to maximize your revenues by choosing the best call routes, as well alternatives routes. CDR generation ensure simple and easy billing. Simplifies call route management, and reduces operating costs.